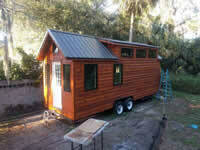 Tiny Home Builders tiny house plans have been designed with the Do-It-Yourselfer in mind. While some plans require extensive contracting experience to understand, we have laid out our plans in a simple step-by-step format. The placement of each piece of framing lumber is shown and complimented with a 3D rendering showing exactly which area of the house you are looking at, making our plans some of the easiest to build from. As you search for tiny house plans, there are a few things that you will want to look out for. Not all plans are created equal. 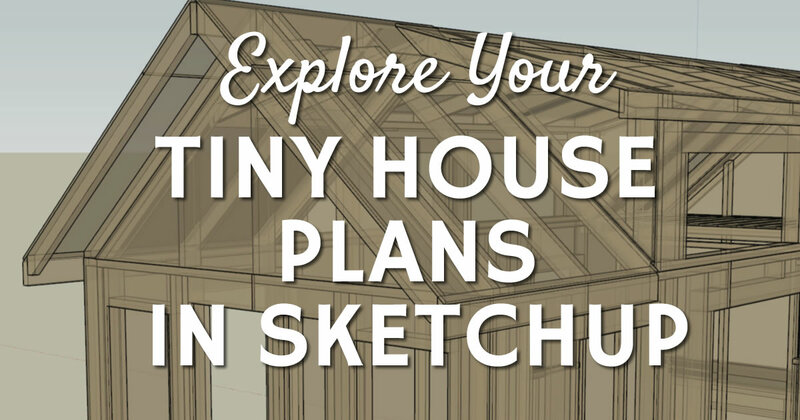 An often overlooked aspect of tiny house plans is the experience level expected from the reader or builder. For instance, conventional house plans typically include a floor plan and then a page of detail diagram that show the specific way the materials fit together in specific areas of the house (e.g. above a window or at the roof). The builder is then expected to use his knowledge to fill-in the gaps. This approach makes sense for larger projects, as having drawings that show the placement of every stud would be overwhelming and make the plans too verbose. 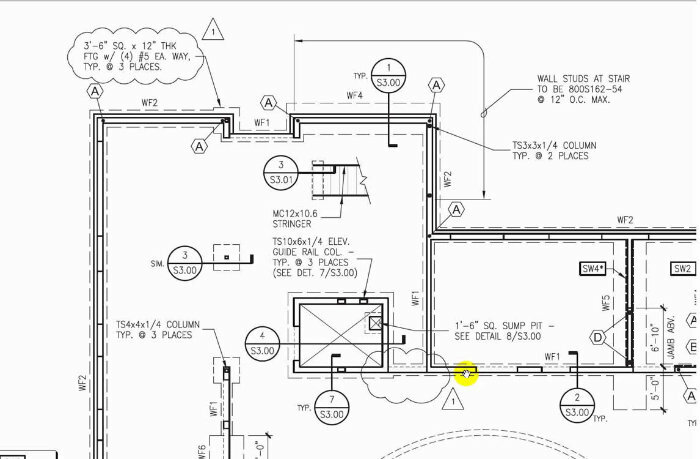 The problem is that if you aren't an experienced builder this style of plans can lack important details that you need. If you are new to building, look for plans that are do-it-yourself friendly. Another important consideration when evaluating plans is the source of the plans. Specifically, is the author qualified and have they built one or multiple houses using the plans. It's one thing to know how to use a program like SketchUp, but it's another to understand proper building techniques. The problem is, if you don't know what the proper building techniques are, it can be hard to identify if someone else knows them. After all, we don't know what we don't know. One sign you can use to help identify those that are more qualified is if they've built at least one house, preferable many, of the design you are interested in. The benefit of having built multiple copies of the same house is the designer has had a chance to work out any kinks that may have been accidentally included in the first iteration. Tiny Home Builders only sells plans to houses that we’ve already built ourselves. The value of a detailed material list cannot be understated. A material list can save you both time and money, often well exceeding the cost of the plans. With a material list you can significantly decrease the number of trips to the store since you will know what you need before you begin. It can be incredibly frustrating to buy all the supplies you expect you will need for the day only to return to your worksite and realize you forgot something and have to return to the store. Depending on your proximity to the store, each trip can easily consume a good portion of your day. Having a materials list can also save a lot of money by allowing you to take advantage of significant builders discounts at the big box stores. 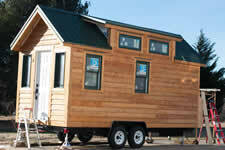 I go into detail of how to do this in the Tiny House Design & Construction Guide. Finally, you will want to consider the format of the plans you are buying. Some plans come in a changeable format, like SketchUp or AutoCad, while others can only be printed. This can be extremely important if you are considering changing the plans from what the original builder designed. On the other hand, if you want to build exactly what the originally builder built, the plan format is not as important. 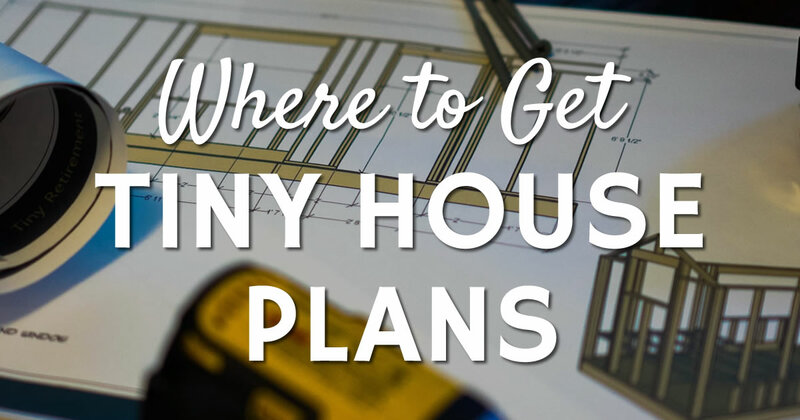 When your tiny house plans come in a change friendly format, any changes are considerably easier for you or an architect to make. If the plans come only as paper plans or a pdf you print yourself, any changes will require the plans to be recreated in an editing tool, again like SketchUp, and then the changes applied. This process can add considerably to the cost and time required to implement your changes. 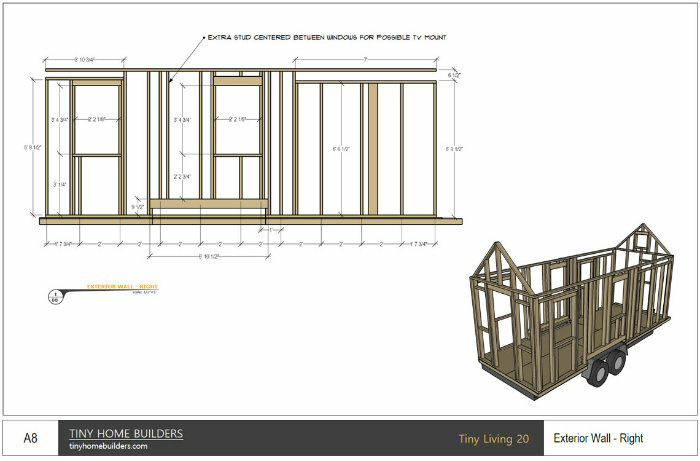 Each of our tiny house plans are printed on 18 x 12 inch sheets of paper. This large size makes them easy to read and provides enough room to fit all the relevant information per step on a single page. This eliminates the annoyance of having to flip back and forth between multiple sheets while working on a single part of the house. Our plans are also delivered to you instantly in PDF format. 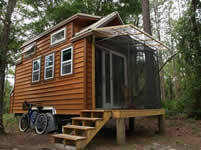 This allows you to start planning right away on building your tiny house. This also comes in handy in the event the original plans are damaged during construction and they need to be reprinted. We’ve had our plans accidentally blow away a few times while building. Our plans are easy to understand. 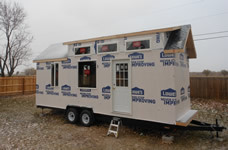 While they are complete enough for a professional contractor, they are also easy enough for the novice to comprehend. We believe that there is no such thing as too much information. Normal plans typically only show section diagrams with the contractor left to fill in the gaps, we show every piece of framing lumber. 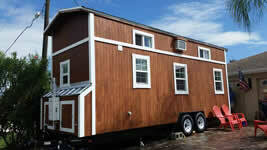 Our tiny house plans include a detailed, itemized material lists. This list allows you to minimize the number of trips to the store while also taking advantage of significant bulk discounts at the home improvement retailers. These discounts typically exceed 3 to 4 times the cost of our plans. The SketchUp model allows you to view the house in 3D and to take any measurement and see how every board fits together. You can even import furniture into SketchUp to see what your house will look like once complete. Having the model also allows for you to make any modifications that you want and then recreate the plans. SketchUp is available as a free download. In addition to the framing and sheathing information, we also provide an electrical diagram that shows the placement on all the lights, switches, and outlets. The placement of these items has been refined over multiple tiny house builds. Over 1800 Tiny House Plans Sold! 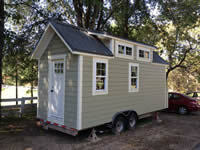 Unfamiliar with our tiny house designs? 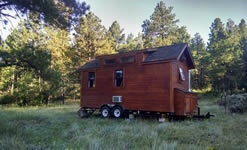 View them all on our Tiny House page. If you aren't completely satisfied with our tiny house plans, just let us know within 14 days and we'll give you your money back. For more details, please see our return policy. Also, your information is safe with us. All of your transaction details are secured by GeoTrust.